Swim Spas/Endless Pools | Palo Cedro Pool & Spa, Inc. Swim Spas/Endless pools are taking over the swimming pool industry with a SPLASH! What makes the Swim Spa/Endless Pools so spectacular? You can be swimming in your very own pool in less than 24 hours. No long waiting time, no having to tear apart your existing backyard, you don’t have to wait for a contractor to install it and rainy weather doesn’t postpone your delivery time. Plus, with the Swim Spa you now have a pool you can utilize 365 days of the year rather than wait for your typical swimming pool weather. These products are awesome! It is like having a gym at your house 24/7. 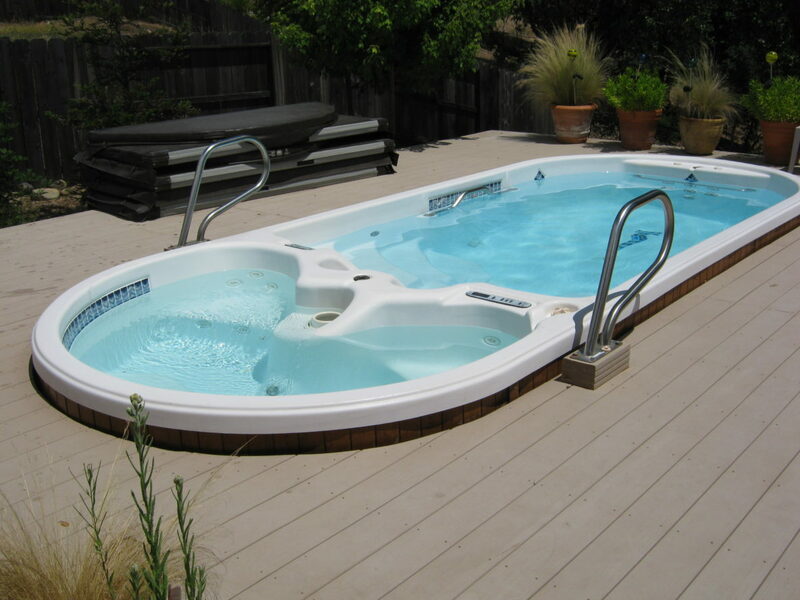 I have been selling the swim spas/endless pools for over 14 years now and the feedback on them has been amazing. The number one comment is, “That it far exceeds our expectations!” These swim spas/endless pools can be used for pure enjoyment or if you or someone you know is suffering from various medical conditions, such as, arthritis, the swim spa/endless pool gives your body the workout minus the harsh impacts. Bet you didn’t know that studies have showed a person who regularly swims has a longer life span and has higher brain activity. I don’t know about you, but I can always use higher brain activity. regular swimming helps with weight control, gives you a healthier heart plus it lowers your risk of diabetes, and stop asthma symptoms. Basically, A swim spa/endless pool gives a person a higher quality of life. Lastly, the swim spa/endless pool is just plain fun!